Lech is a favorite winter ski trip destination for many Europeans. 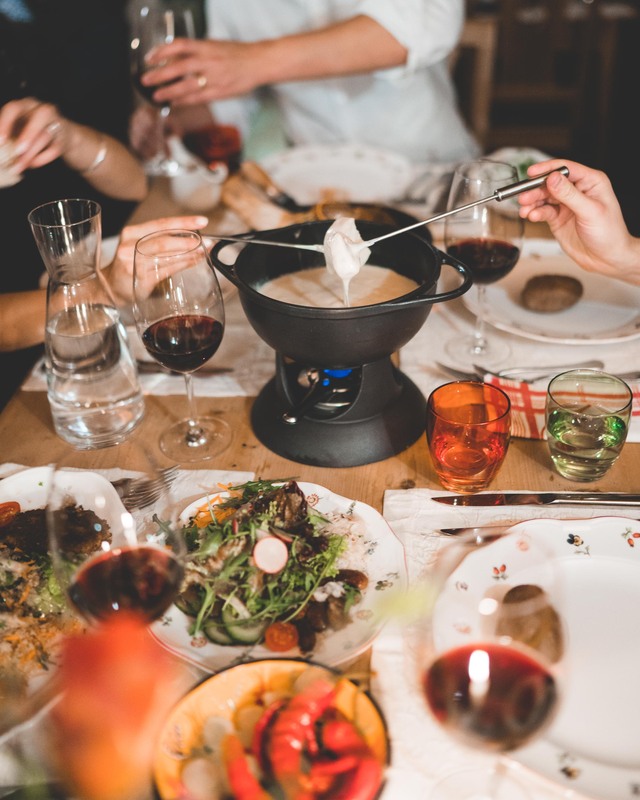 Couples and families plan their visit annually for winter sports, tasty fondue, and sweeping mountain views. 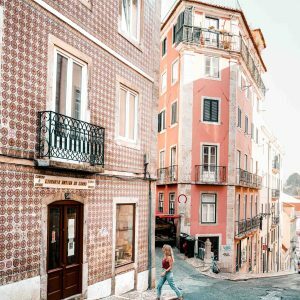 This means accommodations tend to book up a year in advance! 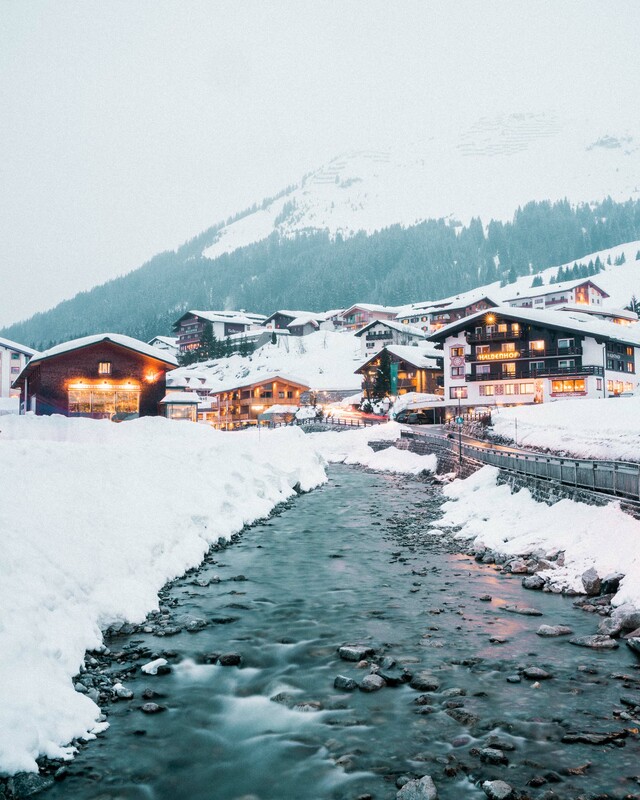 If you’re lucky enough to find yourself in this quaint Austrian town, you’ll be surrounded by locals and visitors who know their way around the slopes. 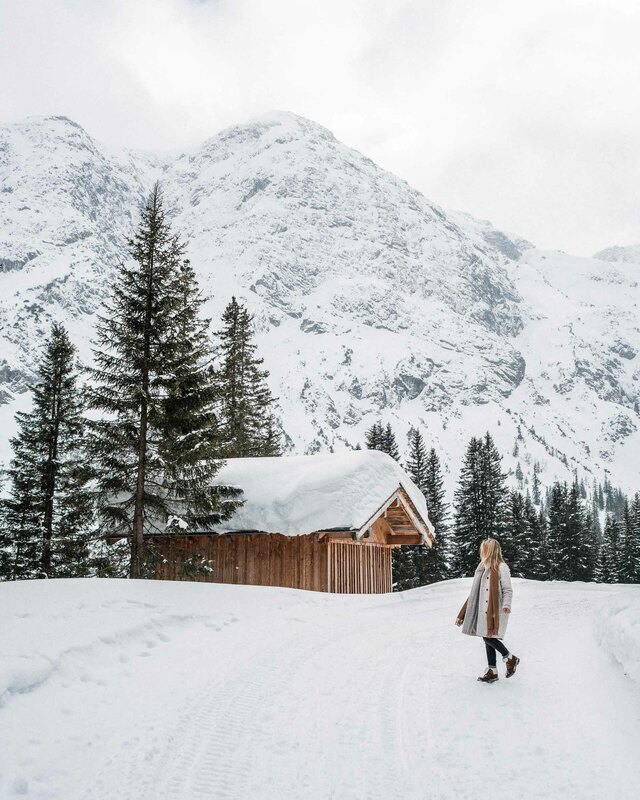 Somewhere between the tasty Austrian delicacies and cozy tucked-in cabins, Lech just might convince you to start planning your own annual visit. 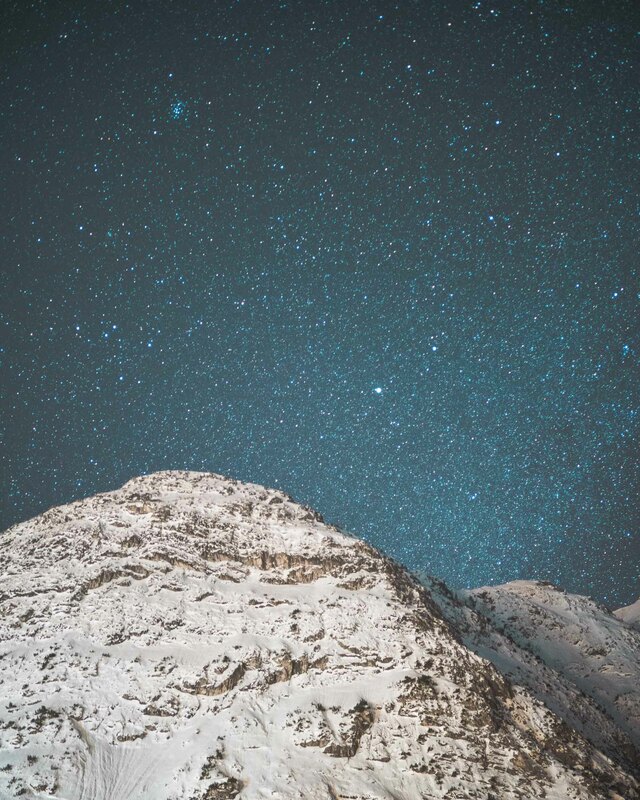 Our friends ski trip in Lech last month was one of those trips that I know we’ll talk about for years! 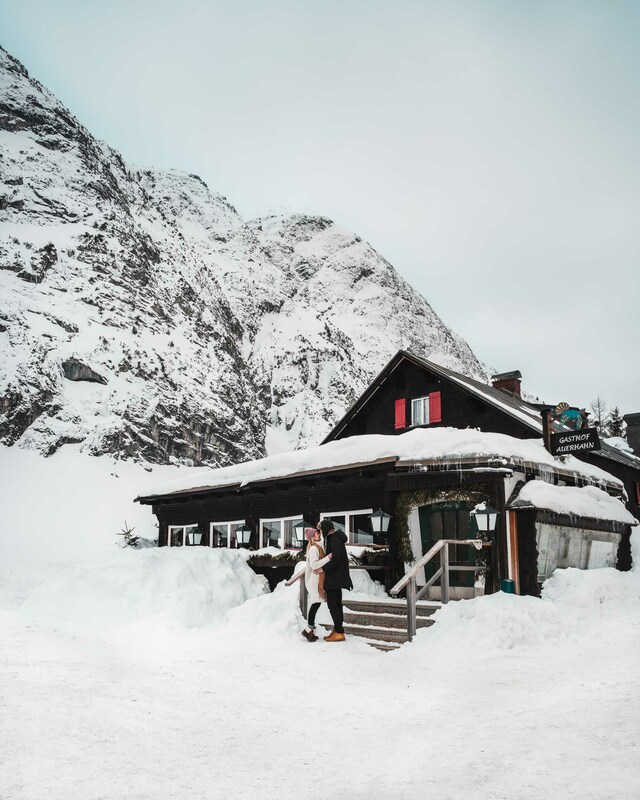 Sandhof Hotel – this upscale family-run hotel is just a couple minutes walk from the nearest cable car in downtown Lech. You’ll love sitting in their cozy lobby to enjoy the fire, or trying out treatments in their in-house spa. 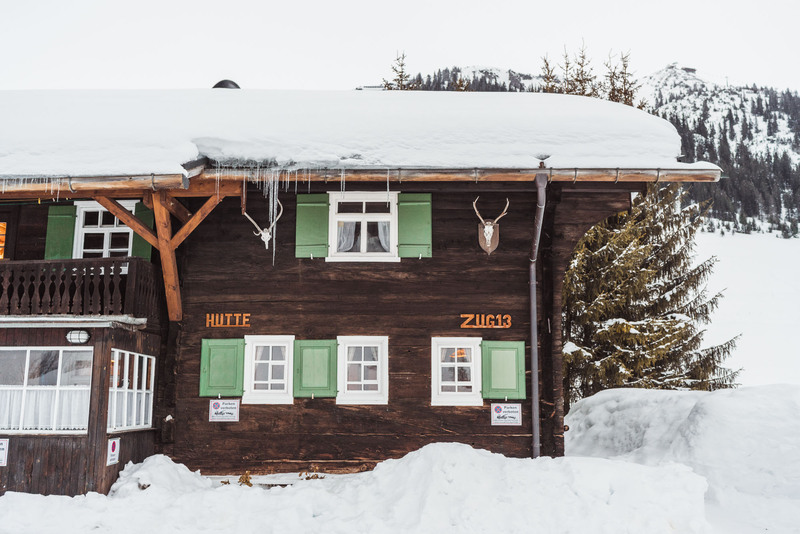 Gasthof Pension Auerhahn – this budget-friendly, 400-year-old guesthouse is located just outside of Lech. Don’t be surprised if the owner, Hans, greets you with schnapps upon arrival. Light sleepers beware – the walls are paper thin! Alpine views from our room at Gasthof Pension Auerhahn. The front of Gasthof Pension Auerhahn. 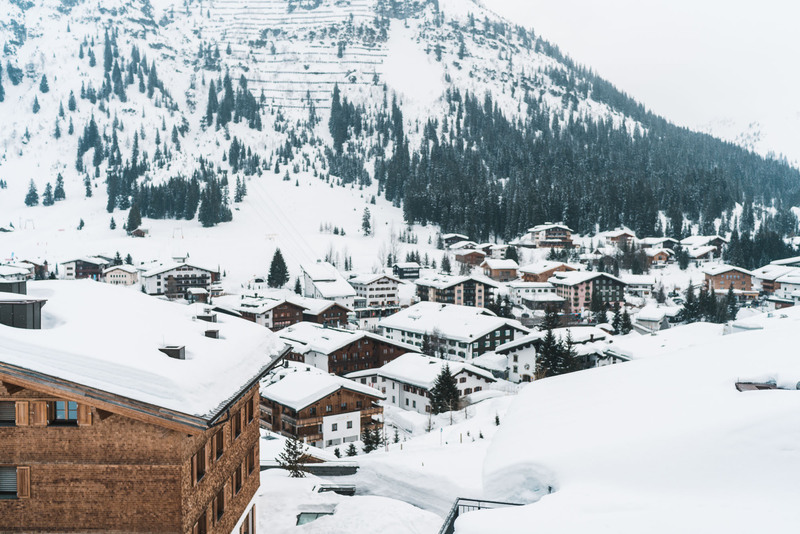 Gasthof Pension Alphorn – located just one town over from Lech in Zug, this cozy hotel in the mountains has everything you need for the perfect ski vacation: an Austrian restaurant, sauna, bar, and free buffet breakfast. 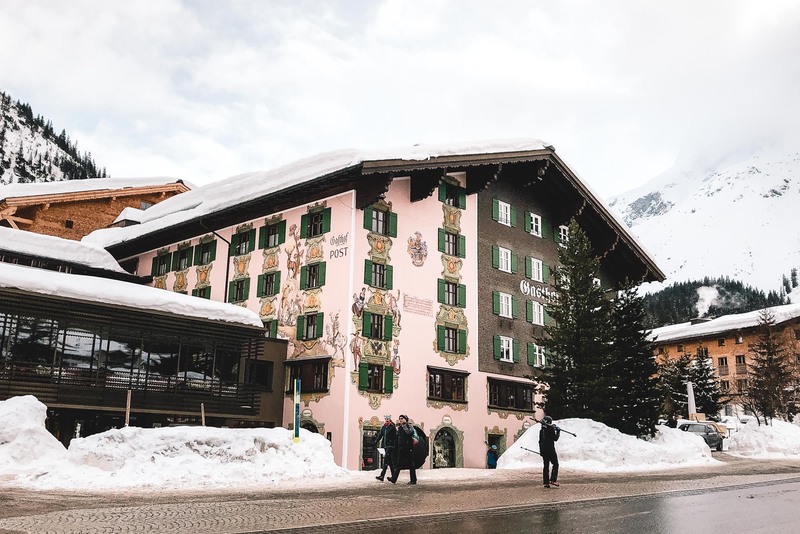 Hotel Gasthof “Post” – this luxurious hotel is located in the heart of Lech. I couldn’t help snapping a photo of the painted mural on the front of the building! Splurge here for a room with your own balcony, fireplace and steam room. Hotel Gasthof “Post”, located right in the heart of downtown Lech. 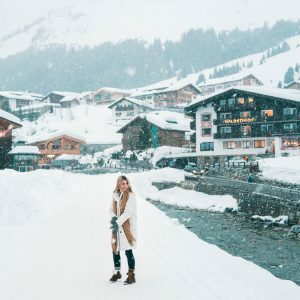 Hotel Arlberg Lech – for a real treat, stay at Hotel Arlberg Lech. Their spa features an indoor pool, a long list of treatments, a sauna and steam area, and a yoga studio and gym…if you can leave their plush rooms! Gasthof Pension Auerhahn – some of the best restaurants can be found in Austria’s ‘gasthofs’, and this one is no exception. Dine on schnitzel, risotto, and spaetzle with views of the alps from your dinner table. Der Wolf – a modern lunch spot located on the slopes, with fresh soups rotating daily. Beer is always recommended. Hus Nr. 8 – traditional Austrian fare is served in large portions at this cozy old-fashioned restaurant. 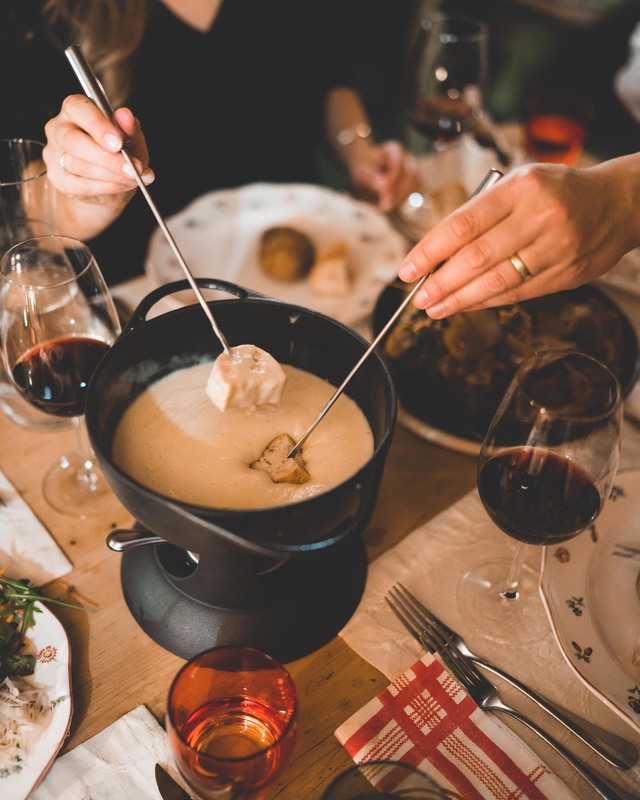 Order the pork knuckle in advance, or indulge in their classic fondue. Downtown Lech in the snow. Traditional fondue at Hus Nr. 8. Burg Schenke – this hotel-restaurant in Lech serves up rustic, seasonal dishes with sweeping views of the mountains. 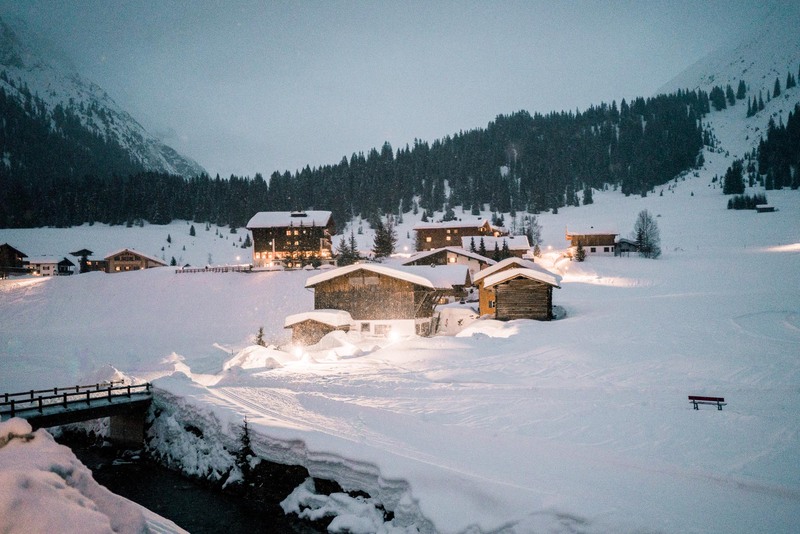 Schneggarei – perfect for an après-ski drink or a group dinner, this local restaurant is loved for its charming ambiance and homemade pizzas. Gampen Restaurant – the ideal lunch stop during your ski day, this large restaurant with a patio features homemade spaetzle as their specialty (and trust me, it’s a must-order). Gasthof Restaurant Alpenblick – you’ll find typical Austrian and German fare in this old-fashioned restaurant in Zug. Save room for their mouthwatering desserts! 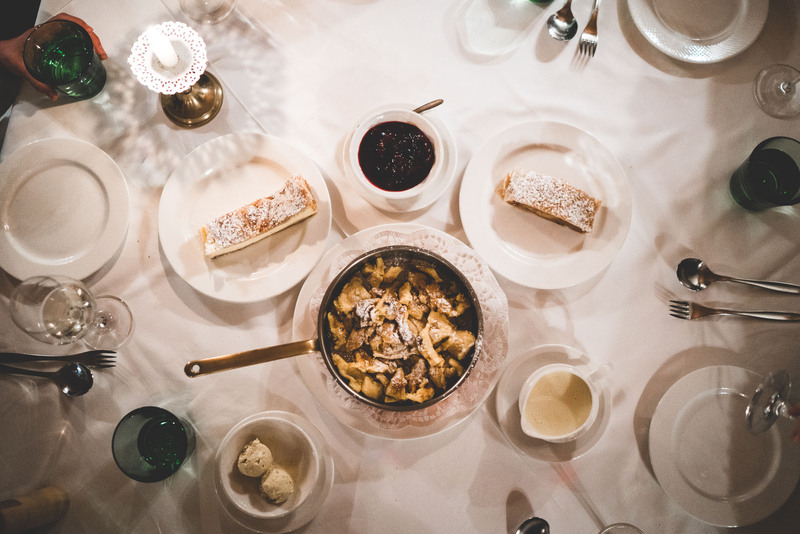 Strudel and kaiserschmarrn at Gasthof Restaurant Alpenblick. 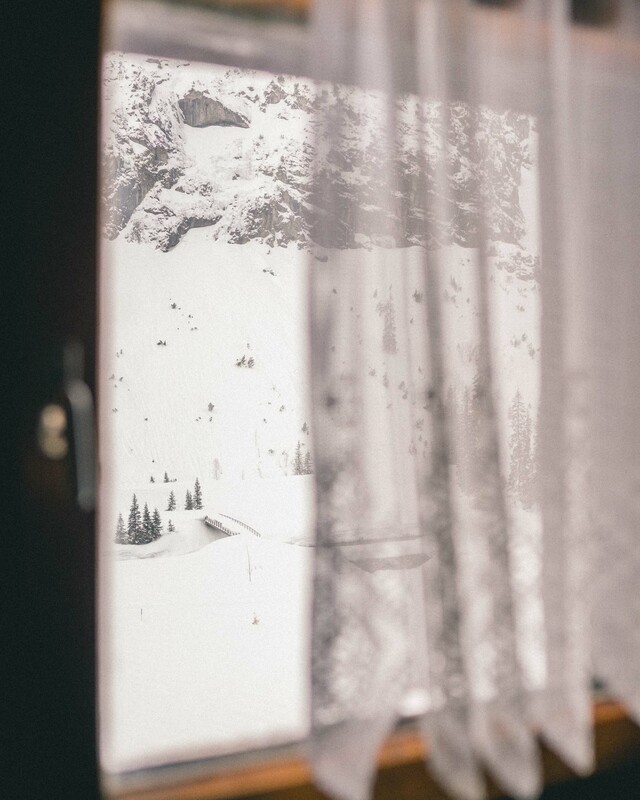 Hotel Krone – start at the outside bar located adjacent to the lifts for glühwein and roasted chestnuts. Or, move inside to select some local wine and beers and cozy up in a corner. Mooserwirt – arrive here after 3pm and you’ll have some trouble finding a table. The après-ski scene at this legendary bar/restaurant gets rowdy. Pace yourself though — there’s still one hill to get down once you’ve had your fill of drinks! 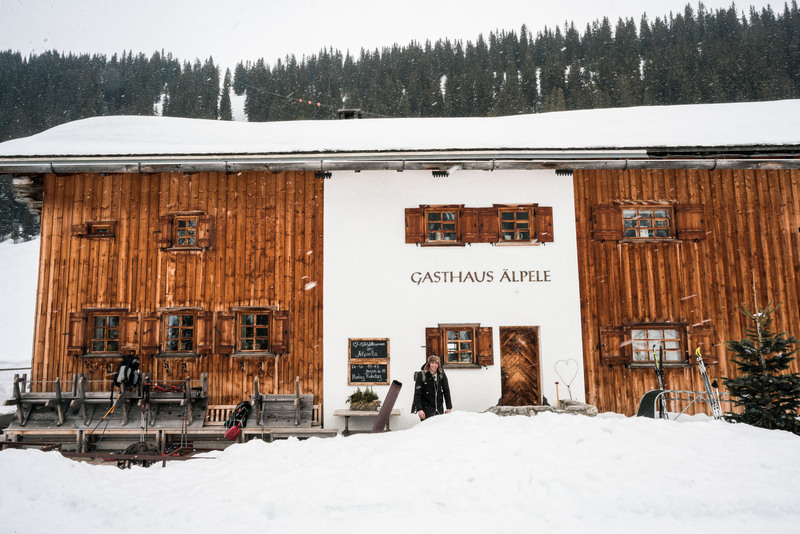 Rud-Alpe Gastronomie – for afternoon drinks, this après-ski locale in the mountains has a dreamy patio and lots of seating to take in the alpine views. Hotel Goldener Berg – wine aficionados will love the variety at this hotel bar with a wine cellar. According to the staff here, they house wine from 1,250 different regions around the world. 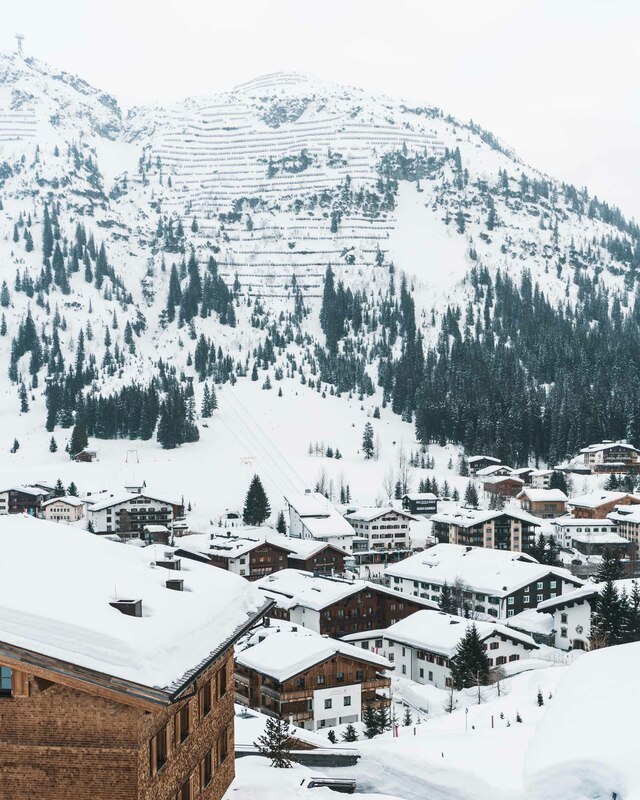 Hit the slopes – our favorite ski areas are Zurs and Lech, but there’s also St. Anton, Zug, and more. Take a look at this interactive map for reference. 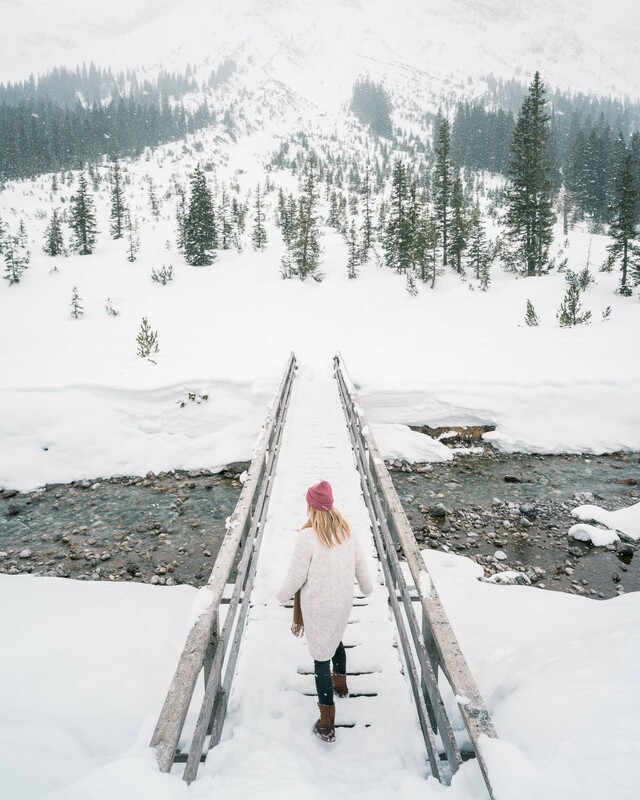 There’s more than 305 kilometers of ski slopes to explore! 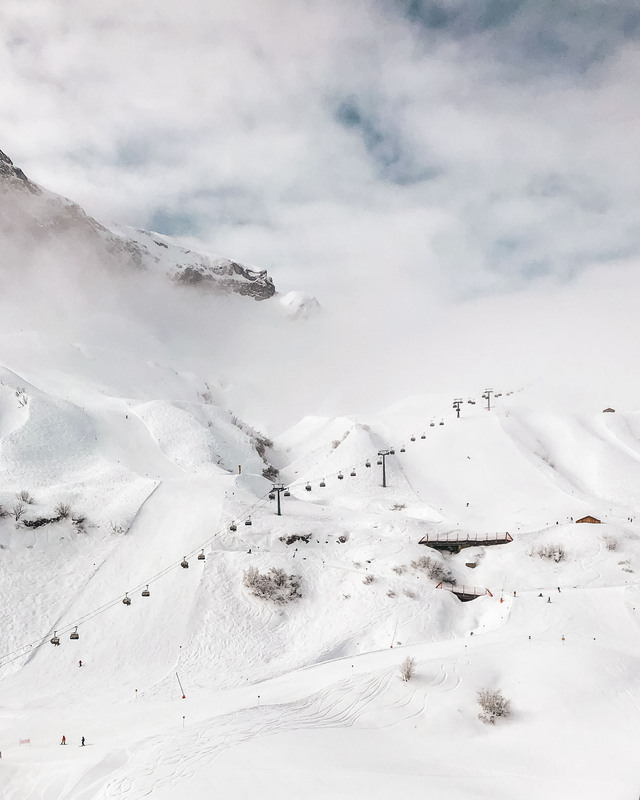 Chair lifts in the clouds in Zurs. 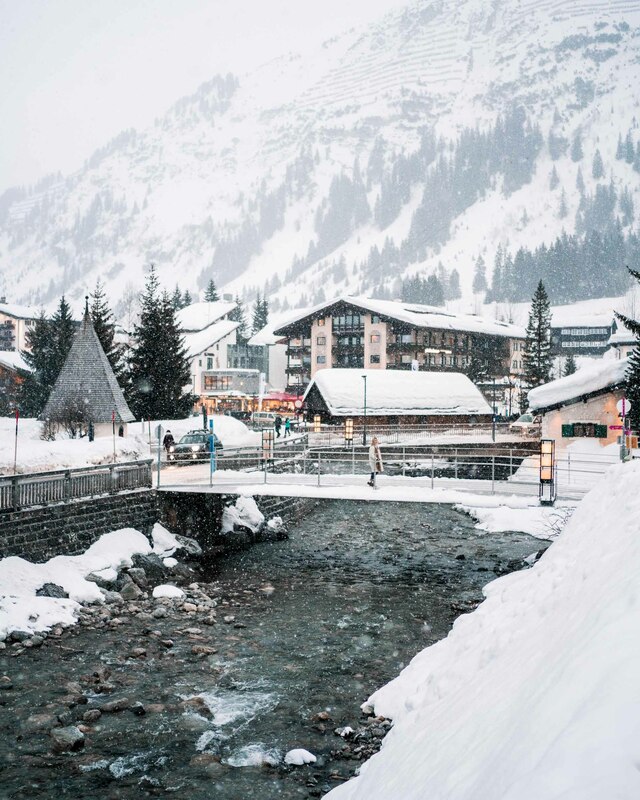 Shop in downtown Lech – head to Lech’s town center to find the best outerwear around. Hit up Strolz for the most high-end ski gear you can find, or Sagmeister for typical mountain wear. Check out the après-ski scene – starting around 3pm, stake out a spot in town or on the slopes and get ready for the music, beer, and bar snacks. The Mooserwirt is a classic and always fills up fast. 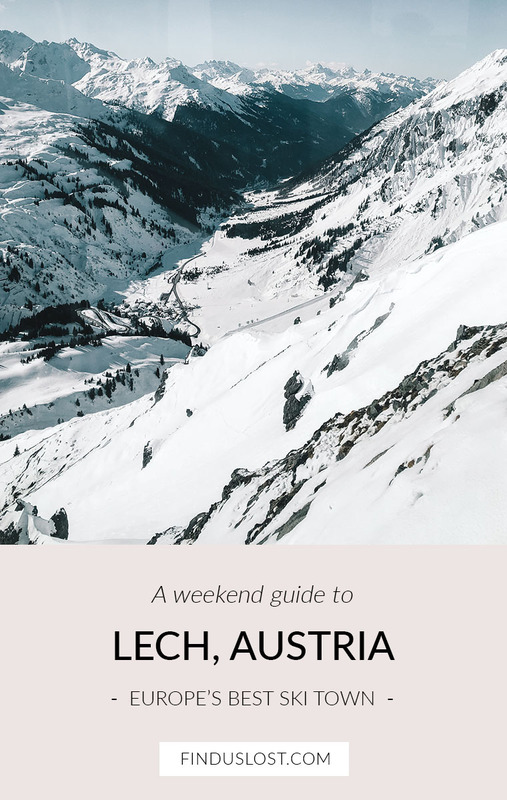 Go cross-country skiing – there’s plenty of trails in and around Lech. Rent skis in town and plan your journey for some incredibly peaceful forest trails. Visit a local spa – most hotels in the area have indoor spas with treatment rooms, like Gasthof Post or Hotel Aurelio. There’s nothing like rewarding yourself after a long day of skiing with a relaxing massage! 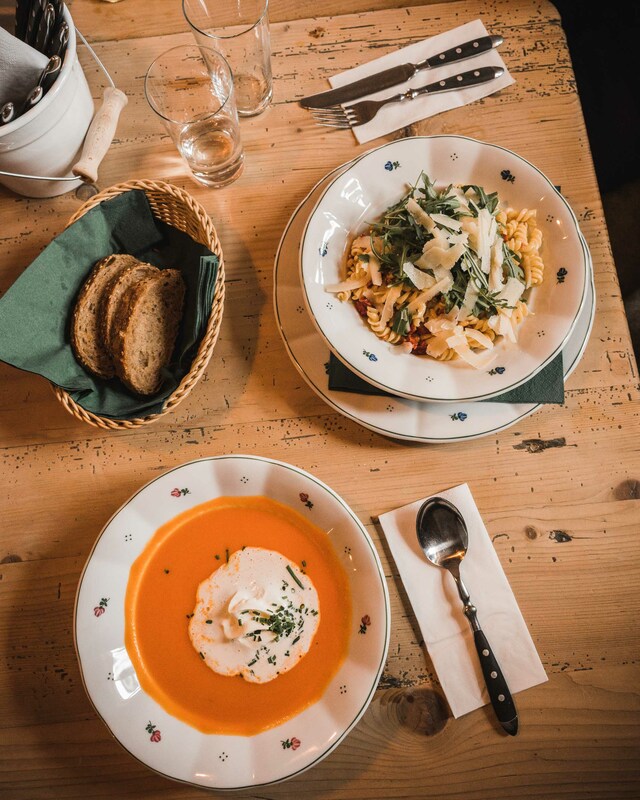 Hike to lunch – where the road ends just after Gasthof Pension Auerhahn, take the path for a 40-minute walk to Gasthaus Aelpele, a local lunch spot. 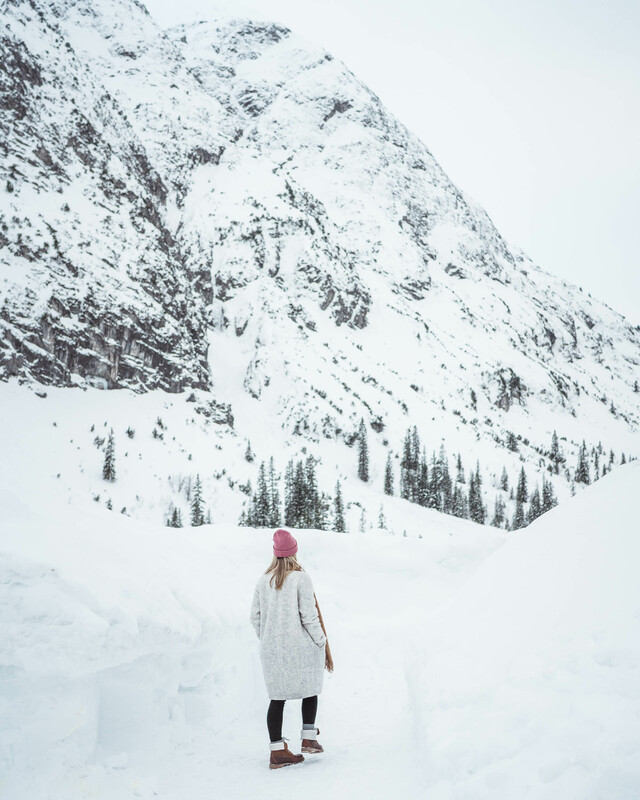 You can also get there by cross-country skiing. Such beautiful photography! Austria is definitely on my bucket list! Thanks Michael. 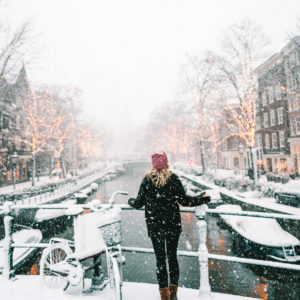 🙂 Austria is always at the top of our list for winter! I’m so glad, thanks Jon! We’d return to Lech in a heartbeat. As someone who went to Lech literally her entire life (My mom was pregnant with me hitting the slopes in Lech, I was put on skies the moment I was able to stand stable on two feet and now being 22 I have been in Lech over 20 times in my life) I can tell you Lech is magic and you really captured that. For me I always get a feeling of coming home the moment our car drives up the Flexenpass from Stuben all the way up through Zürs to Lech. It is just the way Lech and it’s people welcome you that makes you feel like family. I have an one addition to you list: the breakfast at the “Backstube Lech” is really great and you are seated in a kind of parlor which is so cozy. 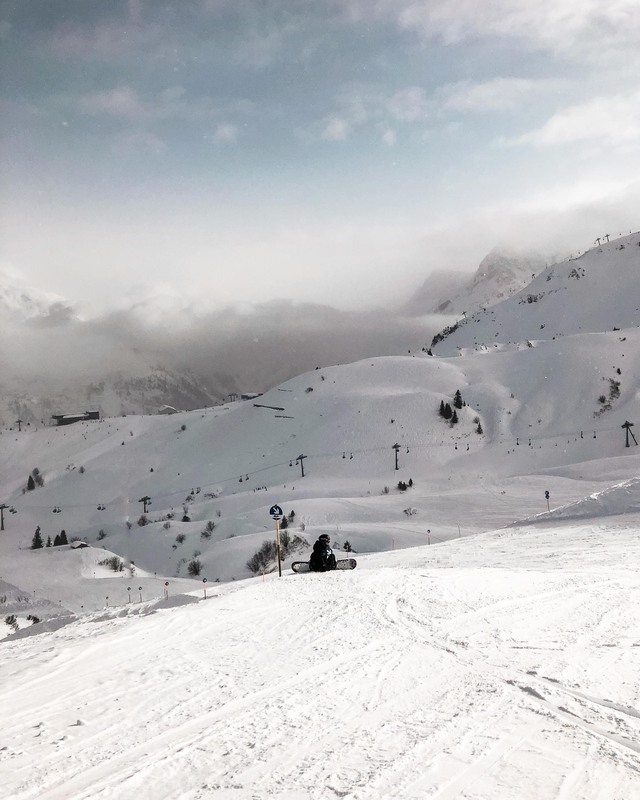 Also my favorite skiing routes (for all of you who have at least have intermediate skiing skills) are the “Zürser Täli”, “Länger Zug” and the very popular “Madlochjoch”. Thank you for your wonderful article and the fotos are stunning.